Optionally we can install a couple of things to make our time at the commandline more comfortable. It makes no real functional difference to the "perfect setup". Install vim in this fashion even if you pushed it onto the chroot system earlier, as this will install it properly. Now you can change the default editor, if you don't want it to be nano. We already have most of the development files we need, and any others we will need will be brought in as we install their main software. As this is Gentoo there is no division commonly seen on other distributions between a package and the package-dev version. While not strictly necessary to make the system work, this will standardise things with the perfect setup for other distributions. We'll create a user called administrator and allow that user to use sudo. 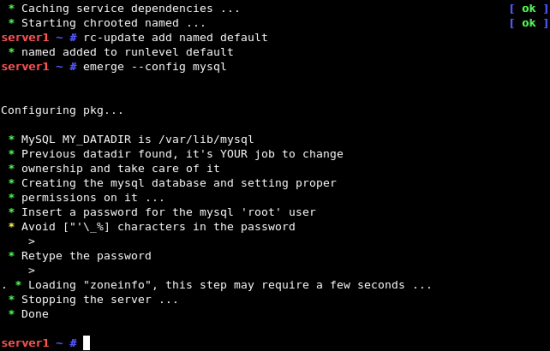 Enter the password, then install sudo. Set up sudo so anyone in wheel can use it. We need quota support in the kernel, and the quota file format version 2. 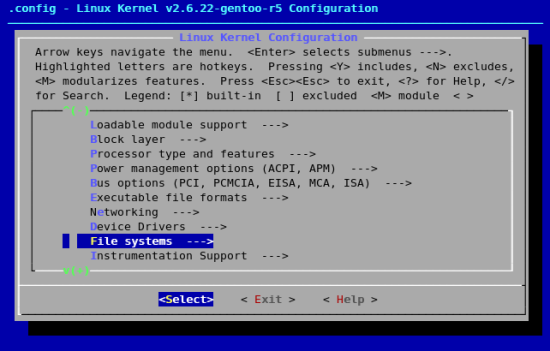 The standard Gentoo kernel does not have quota support. If you've followed this HowTo to do the base install you will have set this up already and you can skip to the next section. Otherwise you need to do it now. These instructions are for the genkernel users. The rest of you probably already know what to do. 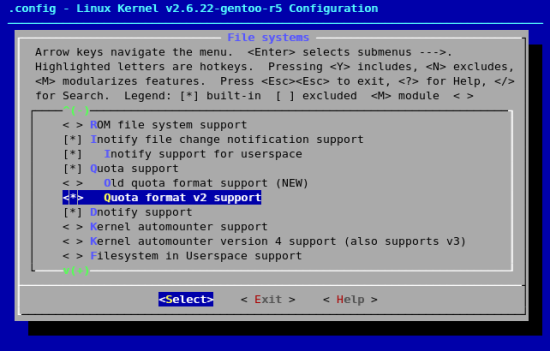 Go into File Systems, select Quota support and select, to be built into the kernel, not as a module, Quota format v2 support. Exit until you're out, saving your kernel configuration, then the build resumes. # you prob want to drop the '-v' from the OPTS vars below. 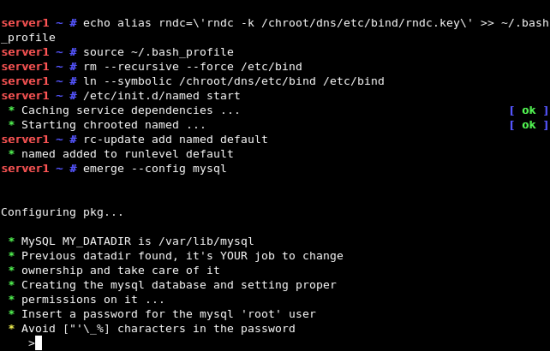 For security reasons we want to run BIND chrooted, so we have to do the following steps. There's no need to configure the logging daemon to include BIND's logs; it's already set up for us. So we start it up. Individual databases can still use other encodings, such as UTF-8. Enter the root password you want to set for the database, and let it finish.